I took a bit of artistic license with this vintage Easter image. It is from a postcard that dates back to the early 1900s. The postcard message of Easter greetings was faded and worn and the edges of the card were folded and torn. 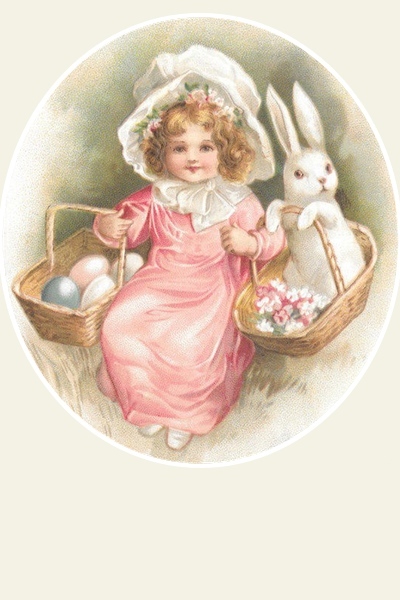 But, Ellen Clapsaddle’s (1865-1934) wonderful Easter drawing was in great shape, so I hope my editing can get you started on making a great Easter card or other Easter-related project. Clapsaddle created a charming Easter image with a little girl wearing a long pink dress with a big white bow and a white floppy hat. She’s holding a basket of Easter eggs in one hand and a basket with a white Easter bunny and freshly picked flowers in the other. Her chubby pink chinks and bright red lips are vintage Clapsaddle.